(3) Tornos mdl. R125 12.5mm (0.492”) Cap Single Spindle Automatic Screw Machines s/n’s 56216, 36604, 26105 w/ 5-Cross Slides, 3-Station Drill Heads, Bar Feeds, Coolant. (3) Tornos mdl. R10 10mm (0.394”) Cap Single Spindle Automatic Screw Machines s/n’s 36509, 36327,36210 w/ 5-Cross Slides, 3-Station Drill Heads, Bar Feeds, Coolant. (17) Tornos mdl. M7 7mm (0.275”) Cap Single Spindle Automatic Screw Machines s/n’s 105096, 105095,105077, 105076, 105075, 95306, 95300, 95167, 95166, 95130, 85283, 85282, 85271, 85270, 85269, 85268, 75914 w/ 5-Cross Slides, 3-Station Drill Heads, Cross Drilling Attachments, Bar Feeds, Coolant. Screw Machine Accessories, Collets and Tooling. Namora Type 1032 Pneumatic Secondary Chucking Machine s/n 60763 w/ 48-Station Automatic Parts Loader, 3-Cross Slides, 2-Station Drilling Head, Cross Drilling Attachment, Auto Eject, Coolant. (16) Namora Type 1022 Pneumatic Secondary Chucking Machines s/n’s 800359, 800356, 781246, 91273,91270, 90855, 81280, 80272, 80271, 60558, 40865, 40767, 40362, 30764, 30752, 30422 w/ 48-Station Automatic Parts Loaders, 3-Cross Slides, 2-Station Drilling Heads, Cross Drilling Attachments, Auto Eject,Coolant. (2) Standard mdl. 10-901 MSO Multiple Secondary Operations Machines s/n’s 64F-194, 62D-152 w/ 5-Station Parts Turret, (3) Drilling Heads, (1) Cross Drilling Head, Auto Parts Eject, Coolant. 1999 McLean mdl. 1000 CNC Second OP Lathe s/n 5694 w/ McLean CNC Controls, (2) Pneumatic Cross Slides, Pneumatic Drilling Head, Pneumatic 5C Collet Closer. Cadillac 14” x 24” Geared Head Gap Bed Lathe s/n C56930 w/ 83-1800 RPM, Inch Threading, Tailstock,KDK Tool Post, 5C Collet Closer, 8” 3-Jaw Chuck, Coolant. (2) Hardinge mdl. DSM-59 Second OP Lathes s/n’s DVB-59- 6667-3, DVB-59- 6318-3 w/ 125-3000 RPM, 6-Station Turret, Cross Slide, 5C Collet Closer, Coolant. 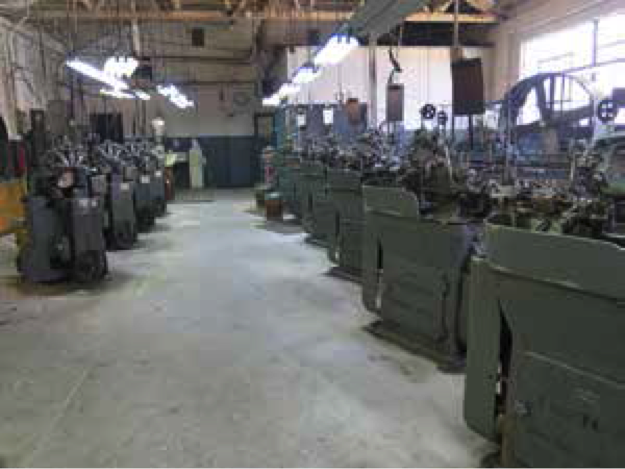 (2) Derbyshire Watch Makers Lathes w/ 4-Speeds, Cross Grinding Attachment, Cross Slide, Collet Sets,Tooling, JH Rosenberg Cabinet Bases. Bridgeport Vertical Mill s/n 113472 w/ 60-4200 Dial Change RPM, Chrome Ways, 9” x 42” Table. Benchmaster Bench Top Vertical Mill w/ Geared Feed, 34T Indexing Head, 6” x 14” Table, Tooling and Cabinet Base. Barker mdl. PMD Twin Duplex Production Horizontal Mill s/n 3486 w/ Pneumatic Feeds, 3C Collet Heads. Royal Master Centerless Grinder w/ 12” Grinding Wheel, 6”Feed Wheel, Hydraulic Wheel Dressers, Coolant. Custom Small Capacity Centerless Grinder. Star mdl. BG-2 Precision Tool Grinder s/n 950967 w/ Diamond Wheels, Tool Fixture, Coolant. Agathon mdl. AG Precision Tool Grinder w/ Diamond Wheels, Tool Fixture, Coolant. Cincinnati Type AS Precision Tool Grinder s/n 299 w/ Diamond Wheels, Tool Fixture, Coolant. Boyar Schultz mdl. 612 6” x 12” Surface Grinder s/n 10203 w/ Electromagnetic Chuck. Christen Type LC21CH Precision Small Drill Sharpener s/n 340830. (2) Burr King mdl. 562 1 ½” Belt Sanders. Black &amp; Decker Pedestal Grinder. Andre Bechler Moutier Cam Inspection Machine. New Holland mdl. K-24 Heated Centrifugal Spin Dryer. New Holland mdl. K-4 Heated Centrifugal Spin Dryer. New Holland mdl. 115V-K11 ELEC Heated Centrifugal Spin Dryer s/n 88641. 2012 Evenheat mdl. HT-1 RM3 4320 Watt Electric Kiln s/n 103668 w/ Evenheat Rampmaster Digital Controls. Sybron / Thermolyne Electric Furnace w/ Furnatrol Digital Controller. Dreher 4-Drum Counter-Rotating Media Tumbler. Econoline mdl. RA-36- 1 Dry Blast Cabinet w/ Rotary Baset. (2) Rockwell/Delta 14” Vertical Band Saws. DB Custom Designed Pneumatic Press w/ Vibratory Bowl Feeder. (2) Servo mdl. 7000 High Speed Precision Drill Presses. Walker Turner Pedestal Drill Press. (4) Walker Turner Bench Model Drill Presses. Somma “Re-Tap- Er” Tapping Machine. Ingersoll Rand mdl. T30 15Hp Horizontal Air Compressor w/ 2-Stage Pump, 120 Gallon Tank. Ingersoll Rand mdl. T30 10/15Hp Horizontal Air Compressor w/ 2-Stage Pump, 120 Gallon Tank. Ingersoll Rand mdl. TS100 Refrigerated Air Dryer. (2) Mitutoyo PJ-A3000 12” Optical Comparators s/n’s 480111, 460103 w/ Digital “X” – “Y” and Angular Readouts, Surface and Profile Illumination, 20X Lenses, 4” x 7 ½” Tables. (3) Scherr Tumico 14” Floor Model Optical Comparators. Ametek Accu-Force III Digital Force Gage. Meyer .011”-.250” Pin Gage Sets. Toledo mdl. 4625-EE Counting Scale. AND mdl. FC-2000i 5Lb Cap Digital Counting Scale. Dillon 750 Lb Cap Clock-Face Crane Scale.